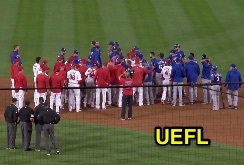 MLB's crisis du jour is officially the bona fide take-out slide, as benches cleared in Anaheim after Rangers baserunner R1 Rougned Odor slid well wide of second base and into Angels SS Andrelton Simmons as he turned a game-ending double play, umpire Chris Conroy ruling the play a legal slide as first baseman Albert Pujols made it all for naught, successfully stretching to receive Simmons' throw as Simmons and Odor chirped and both benches emptied to the tune of "Paradise City" backed by pyrotechnics and Angels Win graphics. TEX R1 Odor slides into LAA SS Simmons. The Play: With one out and the bases loaded in the top of the 9th inning of a 6-0 ballgame, Rangers batter Ronald Guzman hit a ground ball to Angels second baseman Ian Kinsler, who threw to shortstop Simmons, who tagged second base and stepped away to throw onto first baseman Pujols to complete the double play as Rangers baserunner R1 Odor slid toward Simmons. The Call: 2B Umpire Conroy called Odor out at second base, but did not rule that Odor had committed interference pursuant to Official Baseball Rule 6.01(j). Since first baseman Pujols was able to catch Simmons' throw and keep his foot in contact with first base, 1B Umpire CB Bucknor ruled batter-runner Guzman out for the third and final out, thus ending the game and rendering the interference issue at second base a moot-yet-technical point, as Chief Fieldin Culbreth's crew watched the benches clear over Odor's questionable slide. (4) slides within reach of the base without changing his pathway for the purpose of initiating contact with a fielder [YES]. To be frank, this conclusion (that the slide was bona fide) surprised me too. In my mind, in no way should Odor's attempt to kick at Simmons be a legal slide, but, according to the rule, it is. Related Post: Revenge - Benches Clear After Pirates Slide vs Cubs (5/30/18). Related Post: Source - MLB Admits Rizzo Slide Was Illegal, Interference (5/29/18). Disclaimer: We make no judgment as to whether Odor's was a "dirty slide" or not, just its legality by rule. Odor's pathway remains relatively unchanged. On Monday, Bryant clearly changed his pathway to contact catcher Diaz by crossing from foul to fair territory, and on Wednesday, Musgrove failed to remain on the base, but on Friday, Odor didn't change his pathway—Odor made a bee-line for the right-field side of second base from the moment the ball was hit. 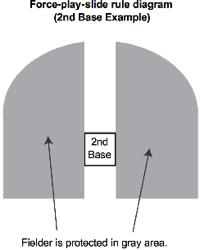 The way the professional rule is written, the runner mustn't change his pathway, but if the runner's chosen pathway well in advance of the impending play takes him to the right of the base, he is legally allowed to maintain that heading, as long as he is able to fulfill all other criteria of the bona fide slide (e.g., touch and remain on the base), and as long as he doesn't initiate illegal contact. If a runner does not engage in a bona fide slide, and initiates (or attempts to make) contact with the fielder for the purpose of breaking up a double play, he should be called for interference under this Rule 6.01. Angels and Rangers meet after the final out. 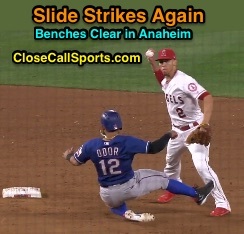 Because Odor engaged in a bona fide slide, as portrayed above, the "and initiates (or attempts to make) contact with the fielder for the purpose of breaking up a double play" clause becomes meaningless. Like the fabled nuclear launch, 6.01(j) requires both the "not a bona fide slide" and "initiates/attempts to make contact" keys to be turned: Because the "not a bona fide slide" key doesn't exist, "initiates/attempts to make contact" is worthless on its own: we don't have interference, at least not yet. Grammatically Speaking: If intentional contact were meant to stand on its own, the proper terminology would be OR, not AND. But...the rules' is an "AND" statement...Let's dig on. As specified above, Odor clearly does initiate contact with the fielder—he elevates his right foot into Simmons' shin—but under the professional rule 6.01(j), this is actually legal: "A slide shall not be a 'bona fide slide' if a runner engages in a 'roll block,' or intentionally initiates (or attempts to initiate) contact with the fielder by elevating and kicking his leg above the fielder’s knee or throwing his arm or his upper body." Precent: Choo legally kicks a middle infielder. Because Odor initiated leg contact with Simmons below the fielder's knee, and did not roll (he slid on his side, but never rolled into second base), this play is perfectly legal. Precedent: Before jumping to Simmons' defense, consider this 2017 play in which MLB—via Replay—established that kicking or tripping a middle fielder is legal, as long as the kick or elevated leg remains below the fielder's knee, and—wouldn't you know—it too involved a Rangers baserunner. In July 2017, 2B Umpire Gabe Morales ruled that Rangers baserunner Shin-Soo Choo violated Rule 6.01(j) by kicking his left leg into White Sox second baseman Yolmer Sanchez as Sanchez attempted to turn a double play. Following a challenge by Rangers Manager Jeff Banister, the Replay Official overturned Morales' call, ruling that Choo's kicking/tripping slide was legal. Related Post: Replay Overturns Slide Rule Violation Call for 1st Time (7/2/17). 6/1/18: Example of an illegal/interference slide. 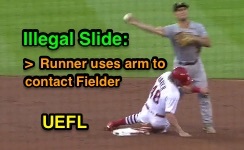 By contrast, Replay Review has overturned slide violation no-calls to interference-aided double plays before (in fact, such an overturned occurred Friday night in St. Louis as a Cardinals baserunner used his upper body to impede a Pirates middle infielder from turning a double play), but as portrayed above, the standard for the runner's legs is different, and more lenient, than that for the runner's arms (leg contact is legal below the knee, while throwing the arm is never legal). To reiterate: the leg may be elevated to a height lower than the fielder's knee, but the upper body or arms cannot be used to initiate contact with the fielder. Related Post: Force Play Slide Rule Makes First Appearance of 2017 (4/7/17). NCAA FPSR's legal slide diagram. NCAA/NFHS Reminder: In NCAA college and NFHS high school, Odor's slide is illegal even without the kick via the force play slide rule simply because Odor slid outside of the baseline directly between first and second base (aka "the channel") and into the fielder's protected area. These codes' "a slide is illegal if—the runner slashes or kicks the fielder with either leg" rule is a solid guide, as well. SIDEBAR: A common alternative response when 6.01(j) doesn't directly apply is Rule 6.01(a)(5), which calls for interference when, "Any batter or runner who has just been put out, or any runner who has just scored, hinders or impedes any following play being made on a runner," or Rule 5.09(a)(13) ("A preceding runner shall, in the umpire’s judgment, intentionally interfere with a fielder who is attempting to catch a thrown ball or to throw a ball in an attempt to complete any play"). That's a fine consideration, but remember that 1) a runner is allowed to continue to advance after being put out with no penalty of interference, and, 2) that means a runner between first and second base is allowed to slide after being put out, as long as the slide is legal, without fear of interference. Even if the runner "hinders or impedes a following play," said runner is not guilty of interference, as long as the runner is legitimately running the bases, which includes the recently-retired runner's engagement in a bona fide slide (Wendelstedt interpretation). Click through to revisit the landmark Boston retired runner's interference no-call in which retired runner Matt Holliday's slide clearly—and legally—impeded the fielder's ability to pursue a baseball. Related Post: MLB Denies Boston's Protest, Interference No-Call Upheld (7/17/17). As for 5.09(a)(13) Comment (the "deliberate, unwarranted, unsportsmanlike action by the runner in leaving the baseline for the obvious purpose of crashing the pivot man on a double play, rather than trying to reach the base" rule), Odor actually did reach and remain on second base, and, as stated above, never actually left the baseline (because he was notably to the right of the line to begin with). 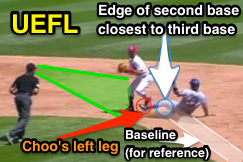 Because 5.09(a)(13) Comment instructs umpires to "See Rule 6.01(j)," we come full circle and start over, finding again that Odor's slide is bona fide, so on, and so forth. It's tough to prove willful and deliberate interference when Odor's actions check all of the "bona fide" boxes and don't quite meet the criteria about "leaving the baseline" or failing to reach the base. Can of Worms: The Angels, oddly enough, should be thankful 2B Umpire Chris Conroy didn't rule an automatic double play due to slide rule interference. If Texas challenged the call, there stands a chance it would be overturned—just as Replay Review did with Morales' call on Choo—and, if so, there stands a chance the batter-runner would be declared safe at first base due to the dead ball created at the time of interference. In this case, no call turned out to be the better strategic call from the home team's perspective, thanks in great part to Pujols' athleticism at first base. Gil's Call: If applicable to the level of play, malicious contact may be a proper consideration for an umpire who judges that the runner intentionally or flagrantly kicked the fielder in a decidedly non-baseball play. For instance, NFHS 2-32-2d clearly makes kicking illegal, and it is up to the umpire's best judgment to determine whether this action is worthy of such MC ruling. For instance, the 2014 NFHS Points of Emphasis suggest "intentional excessive force" or "intent to injure" as possible considerations for malicious contact, but NFHS leaves the matter open to interpretation. Precisely because NFHS leaves malicious contact open to interpretation, unlike OBR's willful and deliberate rule which has more hoops to jump through, it becomes easier for an umpire to conclude, "that's malicious." For instance, it might be reasonable to conclude that sliding and kicking spikes up on a fielder's leg is malicious in NFHS (also illegal in NCAA 8-4c), but nothing violative in OBR because 6.01(j) specifically states that kicking above the knee is illegal. This best be called interference in school ball. If so ruled as malicious, it would be prudent to eject the offender for this unsportsmanlike act, especially if one were to view the runner's intentional kicking action as an attempt to injure the fielder. In my view, under this framework, Odor's slide (despite its bona fide status at the professional level) is worse than Bryant's for the simple reason that Odor intentionally kicked Simmons, whereas Bryant recklessly slid into a defenseless catcher: With Bryant, I cannot conclusively gauge intent with regard to injury potential, but with Odor, the optics suggest nefariousness. Unfortunately—or perhaps by intentional design—the professional baseball Rules Committee has opted to afford its runners the opportunity to intentionally contact a middle infielder (or fielder at another base, as appropriate) outside of the baseline during a double play attempt, as long as the runner's leg remains below the fielder's knee and no part of the upper body is used to intentionally contact the fielder. This bona fide slide provision thereby comes across as a hybrid rule—somewhere in between old school "anything goes" baseball and the NCAA/NFHS force play slide rules. The big loophole, from my perspective, is allowing a runner to choose a pathway before the batted ball is fielded. That allows a runner like Odor to run well outside of the physical baseline and initiate legal contact with a fielder that, in all other codes of baseball, is decidedly illegal. Maybe it's time for major league teams to order a bulk supply of shin guards. Manfred Talks Robot Umps - Tech is "Way Up"